Over 400 scouts attended the Kentucky Blue Grass Coal Camporee event on October 27, 2018. 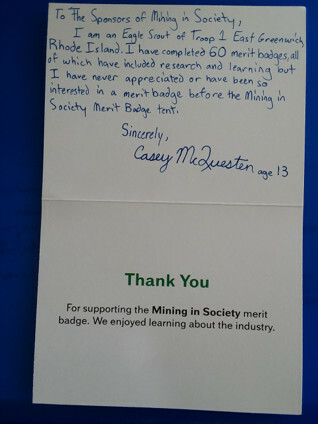 Sixty Mineral Kits were provided to support the scouts in obtaining their Mining in Society Merit Badge. Although the weather was raining and muddy, that did not stop the scouts from having a great time. Kentucky Blue Grass Coal Camporee Scouts observing Mineral Kits. 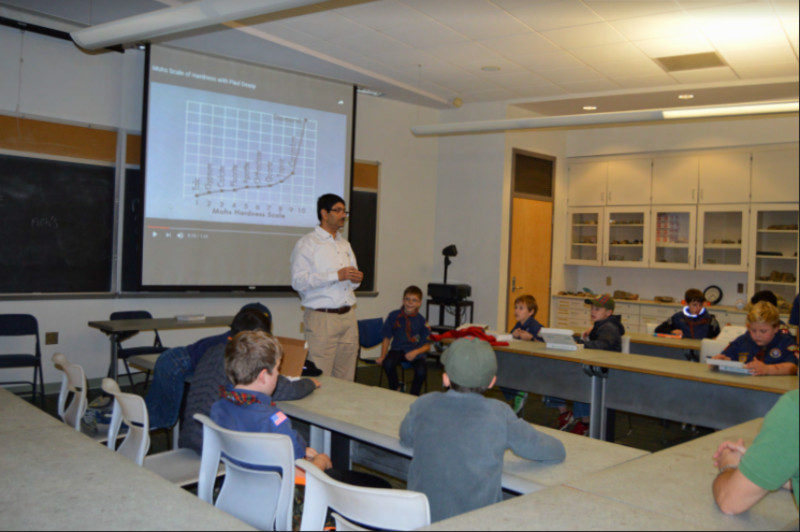 On October 22, 2018, Sekhar Bhattacharyya, Associate Professor of Mining Engineering at The Pennsylvania State University, organized and taught a class to Webelos Cub Scouts from Pack 44 in the State College area to help them with their “Earth Rocks” project. Donald Fisher, a fellow professor from Geosciences in the college of Earth and Mineral Sciences (EMS) at Penn State, talked about his career in geosciences. Patricia Craig, director of Marketing for EMS, came and took photographs. 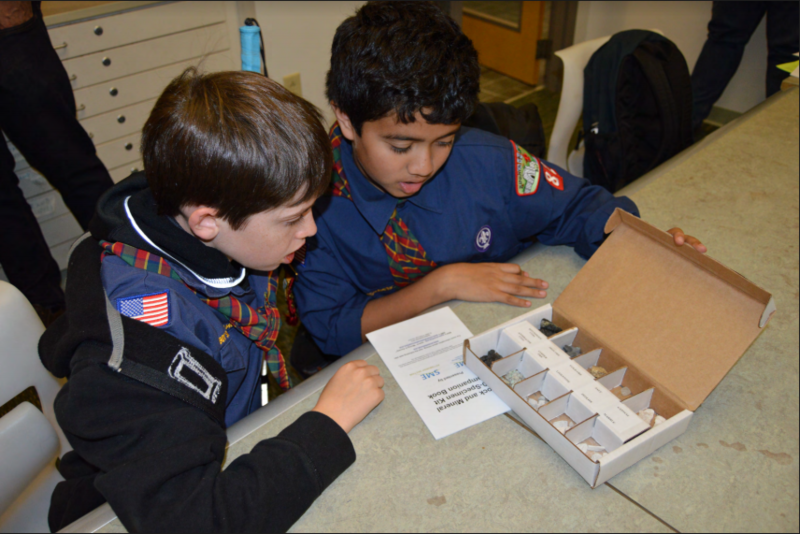 Ten Mineral Kits were given to the scouts on a Webelos campout the previous week. The boys used the kits in this class. Donald Fisher speaking with the Webelos Cub Scouts. Webelos Cub Scouts observing and learning using the Mineral Kits. 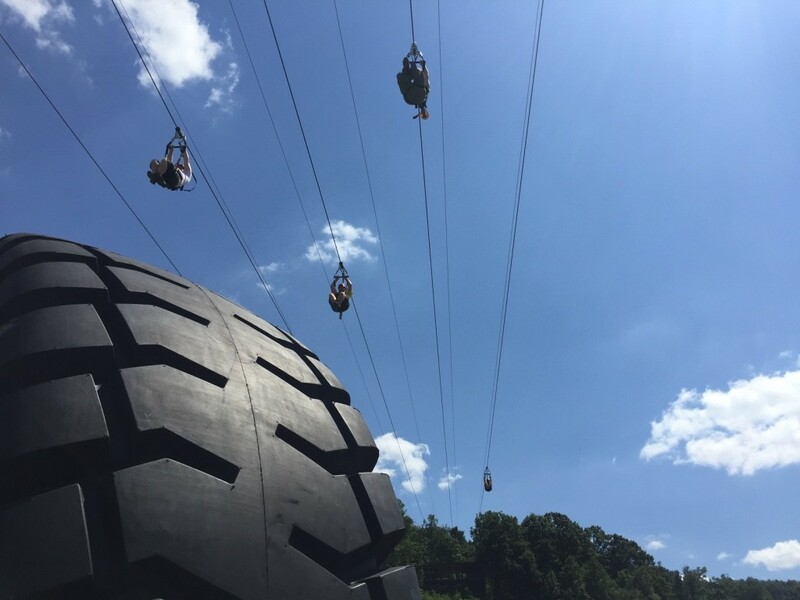 The following is an exceptionally written excerpt from Ginger Hustrulid, Mining in Society Merit Badge Booth Coordinator for the 2017 National Jamboree. Comments may be expressed through her original post through LinkedIn or Facebook at https://www.facebook.com/mineralseducationcoalition/. Thank you, Ginger and all others involved. 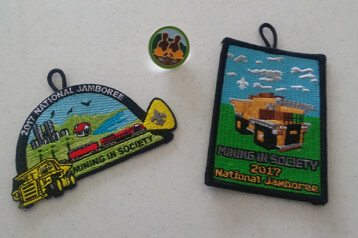 Ginger Hustrulid, Scout, and Dan Alexander and the Mining in Society 2017 National Jamboree Merit Badges. To say the Boy Scouts of America 2017 National Jamboree was amazing, is an understatement. It is hard to describe the incredible feeling of being part of a program that involves about 40,000 Scouts, Venturers, leaders, staff and visitors. The many supporters, donors and volunteers made our Mining in Society merit badge booth not only possible, but very successful. 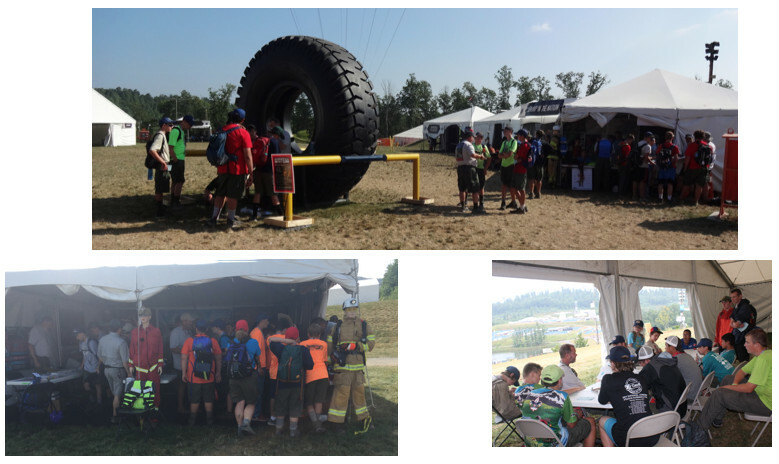 We had an estimated 2,270 visitors to our booth, 817 partial completions of the merit badge, or blue cards, were given out and 618 Scouts completed merit badges during July 19-27th the Scouts were on site and able to do activities. The 12-foot mining tire display was a great reference point and attracted many visitors for photo opportunities and prompted them to ask questions about our booth and program. If you visited our booth and scanned the QR Code, you were given a limited edition Mining in Society Hat pin just for stopping by. Many scouters returned to work on the merit badge, so the hatpins were a hit and a great way for an introduction to our merit badge. Boy Scouts could earn a hard-hat styled patch by completing 4 of the 8 merit badge requirements—two of which had to be about Safety. If the Scouts completed the full merit badge, they earned a Minecraft themed patch (designed by a 12-year-old scout of Troop 109 in Bonita Springs, FL) and the honor of completing the Mining in Society merit badge itself. They also fulfilled one of the NOVA Whoosh requirements. NOVA is a STEM based program within Boy Scouts and incorporates learning with activities and exposure to science, technology, engineering and mathematics for Cub Scouts, Boy Scouts, and Venturers. The hope is that requirements and activities for earning these awards stimulates interest in STEM-related fields and shows how to apply knowledge to everyday living and the world around them. Mining in Society shows how mining is incorporated to everyday life and gets Scouts thinking about if it can’t be grown, it must be mined and how to better take care of our environment. Day visitors, girls and anyone who was ineligible to earn the merit badge were allowed to go through the program to earn a patch or two. We had visitors on all ends of the spectrum earn our patches. Our oldest scouter wanted to earn all the patches, so he sat through the full program. Young visitors did MSHA’s Stay-Out-Stay-Alive presentation that taught them about safety and how to identify abandoned and active mines and why they should not play around those areas. Parents and kids alike enjoyed the education. The Order of the Arrow Garden Ground hiking tour, Sustainability Treehouse and the Geology merit badge booth helped Scouts earn requirements by incorporating portions of our program into their areas. 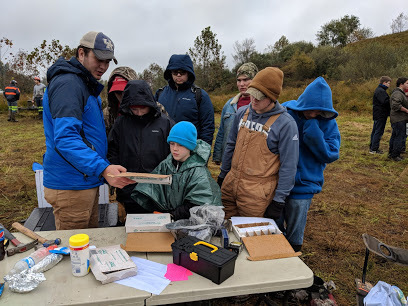 Diversifying our program out into different areas not only helped the scouts earn the Mining in Society merit badge, but also kept their interest and helped them move around the Jamboree and see more things at the Summit Bechtel Reserve. We became so popular at the Jamboree, that we expanded outside the booth and held requirements by the tire; and on the last day, into another tent that was not being fully utilized. Volunteers and Boy Scout Administration all agreed that next time, we need a bigger booth. 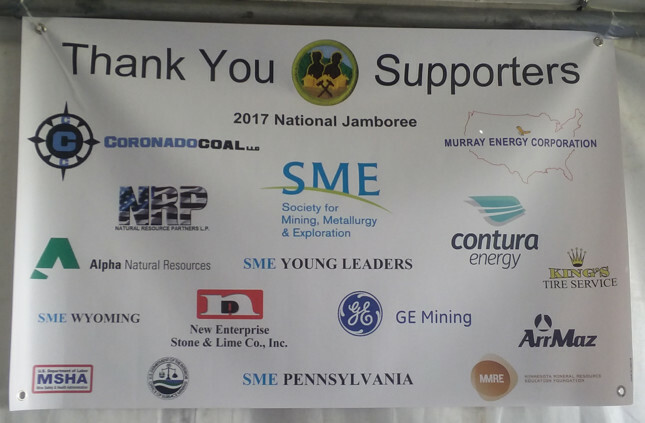 I, Ginger L. Hustrulid, was selected to be the Mining in Society merit badge booth coordinator on behalf of SME for the 2017 National Jamboree and would like to personally give A Big Thank You to the following companies for their generous donations: Coronado Coal, Murray Energy, Natural Resource Partners, Alpha Natural Resources, Contura Energy, New Enterprise Stone and Lime Co., GE Mining, King Tire Service, SME Young Leaders, SME Pittsburgh, Minnesota Mineral Resource Education Foundation, ArrMaz, SME Wyoming; to Coronado Coal and King Tire Service for the awesome tire display; to the companies who sent volunteers including Coronado Coal, Murray Energy, SME, SRK Consulting, Office of Surface Mining, Murray Energy, Caterpillar, Mining Foundation of the Southwest, Jurgenson Companies, Indiana Mineral Aggregates Association, ECSI LLC, Carlson Software, Bakaert Mccferri Underground Solutions, ArrMaz; to the following who donated time, resources or money including MSHA, Mining Engineering Magazine, Minerals Education Coalition, Fenner Dunlop, Precision Pulley, Gold Leaf Placer, OSMRE, Owen-Ames-Kimball, Flexco, McLanahan Corporation employees, Costco, Boyd Denver, Thaman Rubber, Michael Bunch, Martin Engineering, James Jones, R Kacz, Donald Moe, Jess Kindler, Buffalo Wire Works; to the individuals who contributed to the program including Jason Bragg, Karen Rose, Frank McAllister, Steve Gardner, Stan Krukowski, Charlie Zimmerman, Karen Jass, Thomas Rauch, Louis Irwin, Harley Smith, Steve Richards, Katie Allison, Dan O'Connor, Pamela Wilkinson, Corey Barbour, Greg Riggs, Edward Wellman, William Wallace, Chris Butler, Bob Cline, Chris Looney, David Lawson, Eric Lilly, Eddie Nicaj, Fred Mills, Hodge Hunter, Joe Wickline, Leslie Lavander, Tiff Hilton, Paul Jackson, Ryan Murray; to the individuals who donated their time and personal resources to volunteer for the Mining in Society merit badge booth including Tom Barnum, Allen Cooper, Dan Alexander, Dave Scriven, Gary Linley, Trent Carney, Will Wilkinson, Richard Katz, Joseph Hirschi, Michael Maxson; to Bob Scott, Scott Berger, Tim Malaney and Jim Malaney of Boy Scouts of America; to Dave Kanagy, AnnMarie Estrada, Tanya Kriss, Rebecca Smith, Ken Goering, Julie Marinucci and to the many other SME/MEC staff, supporters, donors and volunteers that made this amazing experience possible for Scouts and volunteers alike. THANK YOU!